Alex Terrell is pursuing her Master of Arts in English at the University of Maine, Orono and is currently researching prospective MFA and PhD programs. 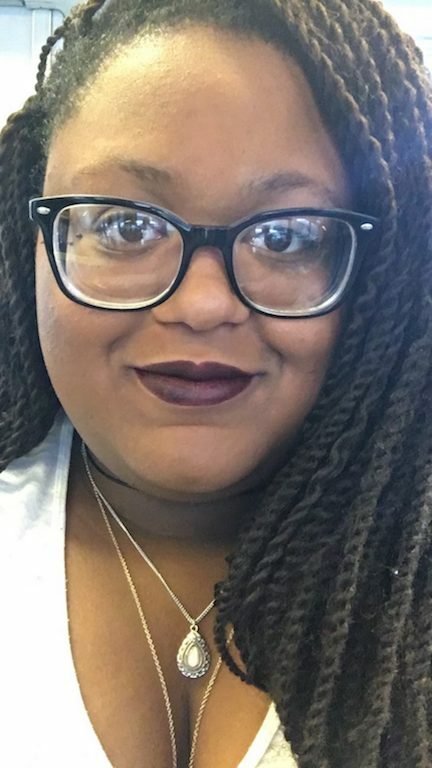 Her research interests include representations of individuated Black experience and Black bodies, magical realism, Afro-futurism and the rhetoric of silence. Alex resides in Orono, Maine, but she is Tennessee girl by birth. Growing up in the South, I was constantly surrounded by the elements. Tornadoes raging in springtime and thunderstorms that shook the house, coupled with my grandmother’s warnings, kept me inside. She warned me that rabid dogs roamed the streets and that men could turn into animals under the wrong moon. At a certain point, I realized I had developed a deep abjection for being outside, for the heat and the critters that buzzed around my head. So, I stayed inside. It seemed unnatural to be anywhere else. The South has a reputation for storytelling—tales from the bayou of Hoodoo, and Boo Hags from the Gullah region. Black people are often warned by their families to stay inside because when we are too visible, ill fate befalls us. We are told that going into the woods is foolish because there are wild things that live there. We should not walk on streets late at night because blue lights may follow us. My grandmother told stories of her youth. She and her cousin would walk home from school, and men would jump out of the bushes to attack them. But, my grandmother lived in a very different time when being Black in the South was as a tree bearing strange fruit. Still, I couldn’t shake the fact that woods were seductive to me. I found myself dreaming up stories of wolves howling and of running wild in the thicket because the woods were full of mystery. They were magical. They held witches and fairy tales and everything that was fearsome to me. Could I be the fearsome thing in the forest? So, I searched the pages of novels and short stories for myself or for anyone who resembled me in these environs. I looked for Black and Brown girls who had sharp teeth, whom fear evaded. I did not see us there. Perhaps, there wasn’t enough space for us. From this, “Black Dog” was born. “Black Dog” was my first attempt to provide a space for people like me—Black girls who had always wondered what lay beyond the trees. In my initial draft, Io wasn’t a real girl, but rather an amalgamation of the politicized and essentialized Black body. In the initial draft, she could not simply wear her sweatshirt with her hood up. What emerged was a sort of police brutality narrative reminiscent of the killings of Trayvon Martin and Mike Brown. I know now that this was the writer trying to understand the writer through the character. This was me coming to terms with my own mortality as a Black woman, but also daring to dream up a Black girl who transcended her race while still being knowledgeable about her place in the world. I struggled through the first draft of “Black Dog” because I was unable to imagine a world where a Black character could walk home wearing a hoodie and it was just that: a hoodie. My first draft of “Black Dog” read as a political commentary on race when it was supposed to be a story about a girl whose insecurities haunted her and a how these insecurities can isolate us. And so, I began the task of vivisection by marking the places of the story that needed cutting. I cut open the stomach and spilled out the guts. I dared imagine Io as more than the sum of her parts. And then she spoke to me. When characters speak to you, it is a moment of pure wonder. When I wrote characters before that did not resemble me, I was able to maintain a certain amount of psychic distance from them. I could be the creator without any regard for how these characters “made me look.” With Io I felt a great amount of responsibility to portray her as honestly as possible. When she spoke I listened. When she told me that Jude needed to be pushed aside to make more room for her, I listened. When she told me that the lineage from which she hailed held magic, I wrote about the Swamp-Wolf of Nawlins. I raised her voice so that for once she was louder than all the rest. What I found here was a real girl. I found a girl who stared into coffee shop windows at beautiful boys. I found a girl who struggled with her body’s changing and her sexuality’s manifesting. And then she entered the woods. And she messed her hair up. And she took out her weave. In a society where women are held to an impossible standard—particularly Black women by Black men—Io freed herself from these standards. She gave me hope that I, too, could surpass the cultural expectations of my community in favor of choice. In Io, I let hope spring eternal. In writing “Black Dog” I found it exceedingly difficult to understand the Black feminine. After all, Io was the only Black character I had ever written. I didn’t know how to understand Io because she carried with her the expectation of writing about Blackness. But, what was Blackness? How did it look? My Blackness differs greatly from the pervasive stereotypes and Io’s did too. This left within me a fear that I would not be able to write her in a way that simply saw her as a person. In the final draft, I became more deliberate in that I recognized that all writing is inherently ideological and by extension political. However, I do not want to write explicitly about politics. Once I understood this, I had to divorce myself from what I thought I knew about my own culture in order to see Io as a fully realized woman and not simply a raisonneur. But how was I to strike the delicate balance between not making this story about race while still acknowledging Io’s Blackness? I went back to her roots. Though she was from the city, her family hailed from country roads. Her blood was imbued with the generations of those who learned to fear the woods. But Io found herself there. Consequently, this, too, was where I found myself. In fiction, white skin is the default unless otherwise specified, with Black people often cast in the role of comedic sidekick and very rarely making it through the second act alive. In “Black Dog” I was determined for Io to make it to the end, but, ultimately, I was determined for her to transform herself into something wild: I let her be something wild. I let her walk home alone at night. I let Io stare her death in the teeth and I let her sprout her own. We must continue to write Black and Brown girls into the very places they are not supposed to be because that is how fair representation is achieved. I look to Octavia Butler who reminds me that a story does not have to be about Black pain. A story can simply be a story about people who just so happen to be Black. This, of course, does not mean that Black pain is a moot point, but rather to address Black pain in literature, we must first understand the individual. To affect change in the world, we must make the different more recognizable. Some writers choose to do this through writing realistic fiction that puts the everyday life under a microscope helping us better understand the world. I do this by placing the reader in an unfamiliar world or a world that is just familiar enough that the preternatural is never questioned. Taking the task of fiction up in this way led me to realize that writers who use genre aspects in their fiction are often marginalized in the writing world and are labeled as “genre writers.” But what exactly is “genre writing?” I asked myself when writing “Black Dog” if it was a “genre piece” or a “literary piece” before realizing that it was both. It is both in the sense that it incorporates genre elements into an otherwise literary piece. I sought to diminish the line between literary fiction and genre fiction by incorporating elements that are representative of those baser instincts and animal part of ourselves that we like to keep hidden. Io reminds us to be the fearsome thing in the dark and that storytelling is inherently magical; anything we can imagine is made up of our own world with our planet as our only form of reference. In this way, the magical is the mundane. To read Alex Terrell’s work and more, pick up a copy of 44.1 or order a subscription from our online store.